Rats have been subjected to tests on LED lighting. Could LED lighting actually be harmful? While we don't suggest that you start hauling your LED bars off your fish tank, for rats, at least, it doesn’t bode well, writes Nathan Hill. LED is hailed as the eco-friendly solution to our lighting needs in all areas of life, and not unjustly. LED running costs and lifespans shame their inefficient predecessors, and within aquatics the enhanced potential for spectral tweaking and controllability that diodes bring is pounced on. LED developers can create ‘synthetic’ light, replicating any spectra found in an open clear stream, a canopied rainforest, or 20 metres below sea level on the equatorial belt. LED has its detractors, but that’s standard with any technological advances. Claims about the detrimental side of LEDs have surfaced, from the reasonable, through the specious, to the outright exotic. For the best part, LED technology has done well in swatting off attacks on its integrity. A huge claim is that LED can cause blindness, and there has been research performed that would apparently support this – with major caveats. Papers have circulated about the effects of LED exposure on retinal cells, but these have been within a framework of acute and high exposure. For example, one oft-regurgitated study in the Journal of Photochemistry and Photobiology turned out to be based on LED exposure which was the equivalent of staring at a 100W light bulb for 12 hours at just a few inches distance – hardly an equivalent to anything we as humans are doing with our lights. Of course LED could cause blindness, but so could a domestic torch if I held it against your eye for long enough. Evidence links some blue LED use and human illness. To be balanced, all strong blue lights (not just LEDs) have been associated with mild headaches and nausea, and in cases of long exposure, there is a known risk of eye damage. With blue LEDs in particular, connections have been discovered with melatonin suppression, which in turn can lead to sleep issues and weakened immunity in humans. It’s hard to then take that particular data and apply it to fish, who have evolved in an environment where light exposure is a far cry from human terrestrial lifestyles, and where a piscine role of melatonin isn’t thoroughly understood, so I’ll not try. Research suggests that melatonin is a feature of fish immunity, but the differences in the role of photoperiods between fish and humans is the shakiest of territory. A new article in Neuroscience’s November 2016 journal, titled Light Induced Retinal damage Using Different Light Sources, Protocols and rat strains reveals LED phototoxicity, has flagged potential problems with LED use at ‘normal’ levels. Whereas former research has focussed on the low hanging fruit of acute exposure – shine lights in the eyes at high intensity for a quick result – a study by Krigel et al. has found that white LEDs can cause retinal damage at an exposure equal to that of typical human use in domestic settings – warehouses, offices and so on. Or rather, it can cause retinal damage in both albino, and, to a lesser extent, pigmented rats. It would take a colossal leap of faith on my part to claw at data built upon nocturnal mammals, and then use it with fish that have evolved to live in a predominantly blue environment, so I will avoid that. The differences are too great. Humans are biologically closer to rats than fish are, and if we have a powerful LED hanging above out tank, with vast quantities of light spillage, and we’re sat there for hours at a time, with unshielded eyes, then there could be a danger we’re taking a hit of something bad. It’s a weak link, but it’s all I have. What did Krigel’s team do, and what did they establish? Research was based around subjecting multiple rats (albino Wistar and pigmented Long Evans types) to both acute and chronic exposures of either fluorocompact bulbs, cold cathode fluorescent lamps, or LEDs (cold white, blue and green). Rats subject to acute light exposure were first kept for 21 days in a low intensity, 250 lux environment (12hours on/12 hours off light cycle) and then placed in enclosures of up to staggered intensities from 500 – 6000 lux for 24 hours, after having their pupils artifically dilated. They were then placed back in to 250 lux enclosures for another seven days before being sacrificed, and the eyes examined under a microscope for photoreceptor quantification. Immunofluorescence was performed on eye sections, and electroretinograms performed on the rats during the exposure process. Unsurprisingly, all rats experienced retinal damage at 6000 lux (all light types), but this this terrain is already well explored. What was interesting was that rats subject to acute exposure at 500 lux (the same as domestic LED lighting) with dilated pupils showed: “a significant reduction of ONL [outer nuclear layer] thickness […] not only in albinos but also, to a lesser extent in pigmented rats,” when examined. But note that the pupils were dilated – that’s important – and we’re talking a 24 hour exposure. That in itself is quite a substantial point, as it does show that LED, when used on a like-for-like basis, has a capacity to damage greater than its analogues in the lighting world. Regarding the obvious damage sustained at 6000 lux, what interests me is that compared to modern reef aquaria, 6000 lux is actually quite low. In a reef system, the minimum lux you want at the base (though to be fair, lux is a bit of an archaic method of measuring light in aquaria now) is upwards of 3000 lux. On an actual tropical reef, lux is around 110,000 to 120,000 at the very top, dropping to somewhere around 25,000 lux one meter below the surface. An albino rat with dilated pupils here has little chance of escaping retinal harm. From a fish’s perspective, it’s safe to say that evolving to live in such an environment has allowed the animals to build in some resistance to such phototoxicity. Unless we’re talking about deeper water species that have had no need to develop optical biological defences, I’d say that it’s unlikely we can draw too much from it. Except, that is, that LED lighting is by its nature more enriched in blue radiations than many other light sources (sea-level, atmosphere filtered sunlight included). This is because it makes more economic sense for lighting manufacturers to start with a blue LED to create white light, and subject it to yellow phosphore coverage in order to reach the desired colour temperature. So, ‘white’ LEDs still pump out elevated levels of blue radiation compared to other white lights. Uncharacteristically for me, it’s not the fish I’m thinking of here. Usually I’m the kind of misanthrope that would watch a whole ocean liner of people going down if that was the balance against saving the lives of a few tetra, but not today. Today I’m also thinking about my own eyes. You see, like you and every other fishkeeper I know, I can spend hours staring into an aquarium. If that aquarium happens to be rigged up with similar LEDs to those in the acute test mentioned, and if they’re pumping out over 6000 lux, then I’m playing the role of one of those rats. The acute test involved 24 hour exposures. I would say that at full swing, I could spend maybe up to two hours at a time looking into a reef tank under intense LED lighting before I had my fill, so I don’t live a close approximation. And I’m not a rat. For the aquarist who relishes their tank and rushes back to it at every opportunity, I’d advise watching out for future research with a keen eye (assuming, tongue firmly in my cheek here, that they still work). At time of writing this, the article in question is trending with what I’d guess to be a flurry of concerned developers and excited wannabe-postgrads looking for a research subject scrambling over each other for any indications of where this is all headed. I should also mention at this point that the experiment also showed that at high exposures, in the albino rats, the most substantial loss of photoreceptor cells wasn’t caused by the LED at all, but by the cold cathode fluorescent lamps (these are the kind of neon lamps that you’d find on the underside of boy racer cars, for example). So, there is worse out there. The rats subject to chronic exposure were placed in specific cages with same light sources as for acute testing (fluorocompact bulbs, cold cathode fluorescent lamps, or LEDs – cold white, blue and green, again) set to a cyclical exposure of 12 hours on/12 hours off at 500 lux, for a period of 8 days or 28 days respectively. They were then sacrificed, and the eyes subject to the same diagnostic procedures as with acutely exposed rats. To quote the paper directly: “After 1 week of exposure, retinal damage was different in W[istar] albinos and L]ong]E[vans] pigmented rats. In W[istar] rats, retinal cell loss following 1 week of exposure was observed only in the superior retina of rats exposed to blue-LEDs. For me, that is a worry — albeit not a huge one. 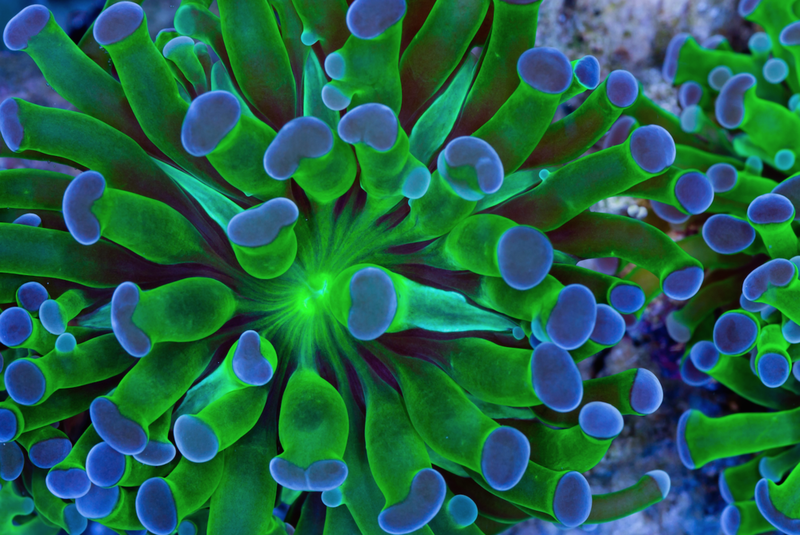 Reef aquarists LOVE blue light – there’s nothing better to make corals ‘pop’. I’ve visited stores where intense blue LED rigs have provided most of the ambient light for the store, provided as overspill from the displays they’re powering. Though I’m not saying you should be wary about going somewhere with strong blue lights, I would say that if you’re a retailer with this kind of rig – do maybe be careful. Later, the article goes on to state that: “[W]e performed an extended analysis of the mechanisms of LED-induced retinal cell toxicity on albino rats, showing that unexpectedly, not only apoptosis was induced but also necrotic cell death, particularly with blue LEDs. This necrotic death triggered an important inflammatory response as observed in our experiments, even at domestic light intensity on albino rats." While the authors accept that: “Extrapolation of animal experiments are challenging[…]” they add that “comparisons were made in this study in a very controlled manner which allow compare the effects of different light sources (sic). What I can draw from the article is a scenario where long term white LED exposure can cause retinal damage in albino rats, and to a lesser extent (and in some cases, such as with induced dilation of pupils) in pigmented rats, and acute blue exposure can harm the eyes of pigmented rats as well. There’s nothing that we can say about human exposure to LED from this, so it’s not the time to start hauling LED bars and pendants from tanks and demanding money back. As I read the article, my opinion at this stage is not to be too concerned. Data aside, I would like to introduce something anecdotal, if for nothing more than raising a conversation piece, and it applies to strictly blue lighting. Note that the human eye has evolved to react to naturally occurring light sources (we went about 100,000 years as a species before we recently came across actinic, for example). Because of that, the action of a dilating pupil is triggered by various wavelengths of light. The problem there is that the pupil doesn’t behave in entirely the same way when subject solely to blue light as it does when subject to a full spectrum. Based on what I’ve covered so far, I’m confident I don’t need to say explicitly where I’m going with this, but I will anyway. If I’m sat staring into an aquarium I’ve set to ‘uberblue’ with my remote controller, and if it’s churning out extraordinarily high lux both in the tank, and all the while there’s light spill over the top of it, and my pupil is flared more than usual while all that blue radiation is flying about with no ‘natural’ light telling my pupil to close up, then I imagine I’ve got the kind of perfect storm that would make a researcher want to line up 50 of me all doing the same for a month so that they can ‘sacrifice’ us after and get all histopathological on our collective retinas after. That’d be some fine data to have, but I doubt it’s coming any time soon. If nothing else, if I ever get an albino pet rat, I’ll be taking extra care not to house it anywhere near a reef set up.